Home Best buy guides Best dog grooming baths | We’ve rounded up the top 5! Best Dog Grooming Baths – The definitive guide! For many pet owners, there is much joy to be derived from sharing time with their pooch. It is (for most parts -:) a fun experience. However, for most of us, there’s a challenge that awaits us regularly…. bath times. Bathing your dog is often not quite a fun experience, and there is always the risk of your pet going rogue. Most dogs will draw the line here, and forget how loyal they are as soon as they get the sense that you’re about to give them a bath! No matter, bathing your canine friend regularly is essential. 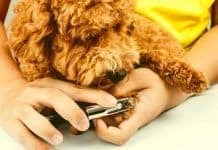 Thus, if your dog is particularly resistant to water, be advised that some tricks and tools are worth having up your sleeve to distract you buddy long enough for grooming to take place. Choosing one of the best dog grooming baths available, is essential for regular baths, ensuring they’re easier and more fun. And no, letting dogs lick themselves clean is not a suitable alternative. Keep reading to find out more about each of the entries in our top 5! Getting your dog into the water is normally the hard part. The physical act of washing your dog, however, is rather fun for most dogs. 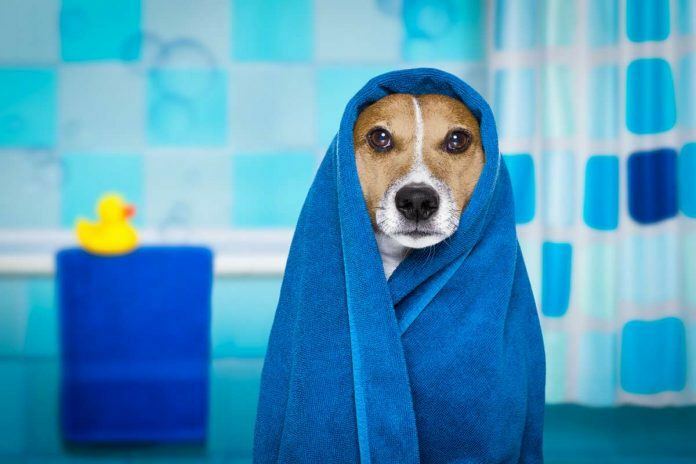 Bath times also help remove dirt, oil and old hair from your pet’s coat. Such sessions notify you of any bump or lump that suddenly appears on your dog. Dogs often develop crusts at the corner of their eyes. Such crusts lead to sore eyes that can cause great discomfort and eye injury. Getting rid of such crusts frequently is thus essential for proper eye care. As you bath your dog regularly, you will often notice and deal with dirty nails. Additionally, you will be sure to trim the above nails regularly which will be beneficial for your friend. Long nails have been proven to cause problems to dogs as they usually force dogs to walk on their pads. This is not only painful but can cause arthritis to the dog’s hips, paws and legs. Such hair often causes the dog pain and discomfort when pulled. Additionally, such tangled hair provides excellent breeding grounds for ticks, fleas and other skin conditions. The inner parts of your dog’s ears can be the perfect place for dirt and bacteria to hide. If not properly groomed, your dog’s ears run the risk of being infected or having inflammations. Either of these can cause undue pain and discomfort to your pet and be expensive to treat. 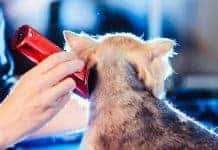 In addition to all the above grooming benefits, you are bound to save on various costs should you follow a proper hygiene schedule for your pet. Prevention has always been the better option right? With regular baths, you will effectively avoid visits to the vet’s office and the associated high costs. Your dog will, also, smell, look and feel much better; be happier and with excellent health. A good dog bathtub will have various functionalities that make bath times more comfortable for both you and your dog. Look for a tub with enough space to fit your dog comfortably but don’t let it be too wide. Too much space and your dog will start having regular sprinkles while in the tub. Secondly, let the tub have a simple and effective restraint. Dogs never stand still and while in the tub, they will try to escape the tank by jumping or shuffling frequently. So, get a tub with quality restraints to minimise this. Additionally, look for an elevated bathtub. It is better than just having a simple basin and you crouching on the floor with every bath session for your dog. A raised dog bathing station will help you avoid back pain from all that back bending. It does not have to be anything fancy either, just be sure to confirm that the tub is elevated. The weight and the size of the dog washing station matters a lot. Heavier canines need especially bigger and stronger bathtubs as a weak one will come with unnecessary risks to safety. Accordingly, be sure to evaluate your puppy’s weight and confirm that it can be supported by the bathtub you fancy before making a purchase. You might easily forget this but proper drainage offers many conveniences during dog bath times. Even tubs meant for outdoor purposes have been found difficult to use when they lack a proper drain especially in between the wash and rinse stage. For a better experience with your dog, be sure not to skip the feature. 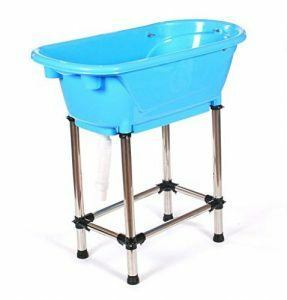 If you are living in an apartment or a smaller house with limited storage, a dog bath station that is easy to collapse and the store might do you some good. Such a tub will be easy to keep away in a closet or some corner of the house where they will cause minimal interference when not in use. This convenient little feature is present in most advanced dog bath stations. When on a flexible tube, the nozzle will allow you to clean even the hard to reach parts of your dog easily. For such convenience, though, you will have to pay a little more for these extras, but it will be a worthwhile investment. Accessibility is particularly important for large dogs that are almost impossible to lift. If you have such a giant canine, this will be a must-have feature. Consider products such as stairs that are specially designed to help your dog get into the tub and out. The type of flooring present in a dog bathtub might make all the difference between whether your dog feels safe while in the new tub or not. Accordingly, look for a dog bathtub that has a lightweight slate that is non-slippery. Should yours have none, you can also consider getting a slim skateboard to enhance your pet’s comfort and safety. What are the Best Dog Grooming Baths Though? There numerous options when it comes to dog bathing stations. From what customers and fellow pet owners have to say though, only a few stand out to get the job done nice and quick. The following list of the top 5 best dog grooming baths that offer great functionality while adding fun to dog bath times. Have a look at each, plus some of the advantages they offer. Don’t forget to read our Dog clippers guide, a good bath and clippers are essential for your dogs grooming health. ou will excuse the guys at Pedigroom for the long tail name when you realise just how ideal this bath is for both pet parents and professional dog groomers. The dog grooming station has all the features needed to make bath times quick and easy and the stainless steel will ensure it lasts a lifetime. Additionally, the bathtub comes fitted with an opening door that slides ups and down with ease when it is time to bath your buddy. You need not worry about breaking your back either; at least not with this bad boy. This dog bathtub from Pedigroom comes with an electric foot control to easily adjust the height. Accordingly, you have the privilege to choose the height you find most comfortable within the 35 – 70-centimetre range. The bath, also, has non-slip flooring and will come complete with a fitted tap and drainage system. If your dog doesn’t like the idea of a bath, there is the option of getting an attachable noose. The accessory will act to fasten your dog for the duration of the bath. The price! The unit is costlier than other options below. If money really is no object and you want only the best for your pet pooch – there is no better dog bath! This is more, a mini-bathtub that Pedigroom designed specifically to make bath times easier and more fun for smaller dogs, and their parents. The bath is made from polypropylene plastic of high quality. It is, thus, the perfect companion for both pet owners and professional dog groomers alike. The hooks fixed on the bathtub allow for easy and secure fastening using any leash you might have while ensuring your dog remains safe and comfortable. 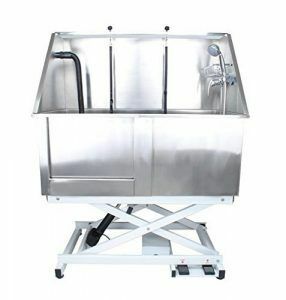 The washing station, also, has a skid-proof floor that ensures pets don’t slip around and hurt themselves. This dog bath by Pedigroom comes with strong aluminum legs that can reach up to 91 centimetres and hold dogs of up to 80 kilograms. You, thus, no longer have to lean over every time you need to bath your dog. These aluminum legs, also, make bathing a less wobbly experience altogether. Doggy Planet’s verdict: Great value for money! This bathtub can be used for an array of applications. It is an appropriate dog bath, fish pond, out-door pool and baby bath. Your objective here, however, is to find out why you should consider it for bath times with your dog. So, here are a few reasons why. Firstly, the collapsible feature makes it quite easy to carry, use and store. You can easily fold and pack it for transport, and your dog can have a bath anywhere, anytime. As a dog bath system, it is also easy to fill up and drain. This makes it the perfect treat for your dog and your other pets to cool off during those hot, unbearable summers. The dog bathtub comes in two sizes; large and extra-large. For the former, you will get 47.3 inches of diameter and 11.8 inches of depth while the latter option gives a 63-inch diameter and 11.10-inch depth. The size of the bathtub might force you to get into the water when your dog escapes you during bath time! We know, it’s another outdoor pool but it does deserve to be on this list for the hot weather fun it will provide for your dog. 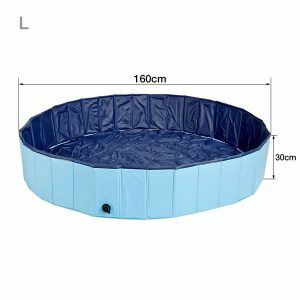 Regardless of the size of your pet, there is great fun to be had in jumping and splashing around in this tub and with a couple of balls to boot. 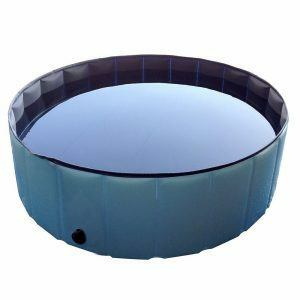 The manufacturer boasts that this doggy pool was built especially for hot days and it is quite strong and of durable material. The inner floor of the tub is, also, made of anti-slip material and as a pet parent, you can choose between a rectangular or circular shape. The dog bathing system is, also, hygienic as it is easy to clean and can be collapsed and stored in minimal spaces when not in use. So, it is quite useful for dog owners with limited space. Kaka Mall made this product to be multi-functional, and yes, it lives up to its high expectation. It can be used as either a dog bathing tub, a dog pool, an outdoor pond, or a fish pond. It can, also, be used by other pets including your cat, guinea pig or rabbit. 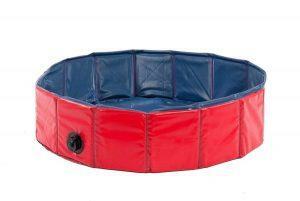 The pool is made of reinforced PVC and MDF material of high quality. This makes it the perfect, yet safe and durable grooming companion for your pet. The tub is easy to use too. Just fill the pool with water and open the drain seal to let off water when done. You will, also, get to pick between three different sizes according to how big your dog is, or how many pets you intend to have in the pool at a go. There is the Small pool, measuring 31.49 by 7.87 inches, the medium-sized pool, measuring 47.24 by 11.81 inches, and the large pool, measuring 62.99 by 11.81 inches. All in all, it is important to remember that your dog will always consider you their best friend. As such, your canine buddy will always be eager to connect with you, every moment you spend – including bath times. 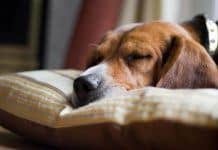 Making your dog’s baths not only fun, but safe will have your dog looking forward to these moments even more, and you will find that your dog will begin to long for such cleaning sessions. So purchasing one of the best dog grooming baths is an important task. So grab one of the five best dog baths above. They represent the best dog grooming baths available, making bath times more special and fun for the both of you. Dog washing sounds simple but it’s often distressing for your pooch – especially if done incorrectly. Watch the YouTube video below, to see how you correctly wash your dog. Note how gentle and slow paces the process is and just how happy the dog appears. This video is a suitable guide for large and smaller breeds of dogs. Next articleBest dog treadmill | Helping to get your pooch fit in 2018!